Great Job to all who raced over the weekend in Portland (USAT Nationals)! Crashing, undergoing surgery, and learning it would be 8 weeks before my arm would be reaching over my head... has changed my way of life, significantly. I've experienced the full range of emotions: shock, fear, pain, gratefulness, disappointment, frustration, amazement (with an out pouring of love/support from friends & family), discovery, desire, motivation (to return to all activity) - it's been a roller coaster. Well, not being able to race in Portland opened my schedule to attend a wedding in Charleston, SC. My good friends, Kate & Hans, got married in true Southern Style on Saturday. Kate and my cousin, Lea, have been best friends since birth (which is how I got to know Kate). Lea made a gorgeous Maid of Honor... and I must say that even though I was sporting a sling (which I made sure matched my dress - actually, I thought about dressing-up the Ultra Sling II with some jewels or pearls) Lea and I were the Life of the Party. Not being at the race was tough - but, what a fun substitute!! I'm so glad I got to be at this wedding. - Kate & Hans: Congrats! Enjoy the Honeymoon. I enjoyed every second in Charleston, everything was perfect. 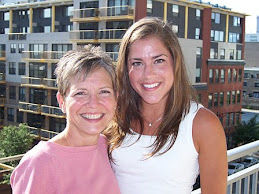 - Mary Elizabeth: if you're reading this - So exciting to meet a new triathlete! Keep in touch. Lea & Ashley (cousins: before going crazy on the dance floor) Woohoo.... Twins! Hi Reed. 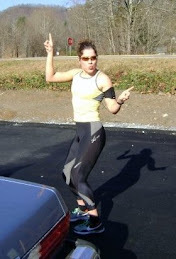 Even if you can't race.... you can still find a way to Dance! - Gman & Janis for taking me out for pizza! And baking cookies. - Matt for delivering calcium pills, and lunch at Chicora! - Jen, Kat, Marit, Andrew, Nicole, Lindsay, Kimberley, Bea -- all for calling to check in! - Thank you EVERYONE for the comments, emails, text messages, emails. Each has brought a huge smile to my face. My last visit to the doctor wasn't great... bones aren't healing very fast or straight. Will continue to sport this sling for 2 more weeks. Might be raising my arm in 5 or 6. Ugh, enough of that talk. My time is spent simply doing things... you'd think that with only one arm, you'd take twice as long to do something - HA, not the case. In fact, it takes four times as long. I have become clumsy and frustrated. The one handed typing is enough to drive anyone crazy! I have made it back to the gym for time on the stationary bike (going from upright to recumbent and back). I also spend time walking - it gets me outside, moving, sweating (still getting in the 90's here). Unfortunately, walking w/ the sling pulls my back all out of whack & I don't know if its helping bone growth? Oh well - I'll go nuts cooped up inside! Missing Nationals next weekend is a bummer. Jen had me ready - mentally and physically. Well JH, to you I send the energy I had stored up for that race ;) Use it for me! Good luck to everyone traveling to Portland!! Instead of heading West - I'll go to a wedding in Charleston. 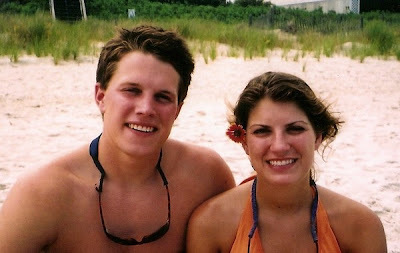 My good friends Kate & Hans are getting married on Saturday. Congrats you guys... So happy I'll be there to share in you special day! Also.... Big SHOUT OUT for the GEORGIA BULLDOGS!!! Off to a Great Season. The South Carolina game was tough to watch (ugly plays and dropped passes had me in extra pain as I tensed up the arm), by my Dawgs found a way to pull out a Victory. 6 days ago, i had surgery to repair my broken clavicle... since then, life has s.l.o.w.e.d down. eliminating work and training from my life has left me with, well, not a whole lot. the surgery was performed on friday morning. a numbing "block" kept me from feeling pain until that evening. then it hit - an extreme pain surging through my arm into my neck and back. i spent the night on my parents lazy-boy downing pain killers. my dad rescued me in the middle of the night, when i had to go to the bathroom (a 10 min ordeal). honestly, there is no way i could have made it through this alone. but, i was in such discomfort, there was no way i could imagine staying with friends (R&G, thanks so much for all you've done to help!! i hope to see you this weekend). so, i loaded up into my dad's van for the trip to nc. my mom would come later in a different car. my dad had brought the van down with the intent of picking up his riding mower and trailer at the john deere place on his return trip. so we headed to waynesville. until this, my shoulder had been under ice - constantly (none of that 20 min on 20 min off stuff). however, the van ride would make this impossible. neither of my parents had any stray leather for me to bite down on... so i had to htfu. we made it to the john deere place. dad got the mower into the trailer and hooked it all up. we continued toward franklin and the fire in my shoulder intensified. finally, we made the exit off hwy 441. the light turned green and my dad pulled out to make a left onto 64. we both saw her coming at the same time... i yelled GO, GO, GO, while my dad hit the gas. unfortunately, our old van (pulling a trailer) has NO pick-up. So, the lady who blew the red light ended up hitting the back of the van and then the trailer. tensing my body for the impact (less than 24 hrs after surgery) felt wonderful. luckily, nobody was hurt. minimal damage to vehicles involved. we called for the police, and waited. i think another driver stopped to act as witness... all parties involved told the same story. all i could think about was getting to some ICE. my week has been rather uneventful since then, phew. i've spent more hours on this couch than i care to admit... franklin is a great place for some r&r. my parents have been amazing: helping with everything. my one major complaint is having to type with one hand. this is torture. it takes me forever to peck out emails - and already i've spent 45 min on this post. but, i think slow is my new thing. there are many other minor complaints, but i try to shake them off quickly. when i begin to feel down about my current situation (damaged body unable to complete the race season i'd planned), i remind myself just how luck i am to know i'll be up and running soon. every time i close my eyes, i still feel myself flying down that hill and off the road. i was so fortunate to walk away from that wreck. today we'll return to greenville. i'll be glad to get off this mountain and back to my house. franklin is amazing, but the surroundings are teasing me here. You can feel a touch of fall in the morning air (making me want to go out and run); the lakes are clear (i want to jump in); and the winding roads beg for cyclists to climb their path (i'll be back). this area is just too perfect for training.... and honestly, there is not much else to do. i'll go back to civilization and continue to heal. actually, katherine (who just kicked booty at im louisville), nicole (who had back surgery the same day they worked on my clavicle), and i have planned a pity party for sat night. we should be a pretty attractive 3 some. i also want to thank everyone for the emails, calls, texts, and comments. seeing such an outpouring of support has lifted my spirits and kept me from getting too down about this whole ordeal. i will need you all as i recover and then try to get back into shape.